Performance and pricing determine the "4G experience"
The phrase "4G network" suggests a seamless blanket of high-speed data connections that are always reliable. Yet the actual deployment of 4G macro cells are highly local and, as a result, there are wide variances in performance and reliability. Who has the most 4G coverage? At the same time, carriers are experimenting with new data plans for the new 4G networks, adding to the calculus users must perform when trying to figure out if or when the move to 4G is worthwhile. RootMetrics tests wireless performance in 75 markets every six months. The most recent "Need for Speed" report for the first half of 2012 is online. 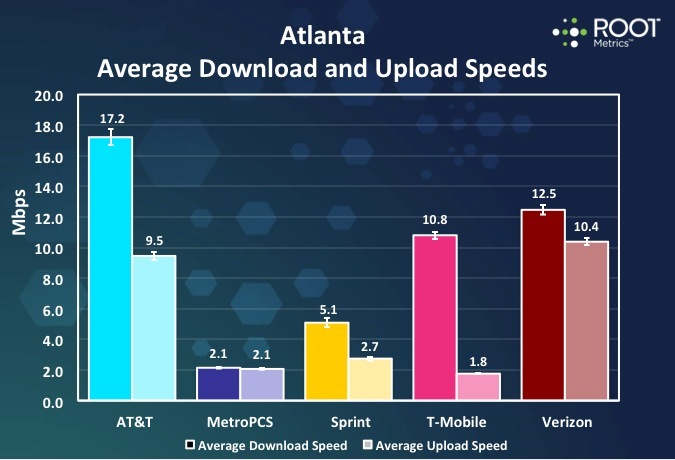 The data speeds are averaged (across LTE, 3G and 2G connections) for data, voice and texting, and packaged with interactive maps that show coverage and performance by carrier. It lets you compare carrier performance and even drill down to the city block around a home or business. The RootMetrics' tests show LTE typically delivering average download speeds of 12M to 18Mbps. HSPA+42, being deployed by T-Mobile, averages around 8Mbps. "If you can get LTE, you'll be four to five times faster than you are today on 3G," says Bill Moore, CEO and president of RootMetrics. In part, that difference between 3G and LTE hinges on the amount of spectrum available in a given area to a particular carrier, but also on LTE's much greater capacity and efficiency compared to 3G. For example, one crippling issue for early smartphone users on 3G data networks was less about the amount of data being sent and more about the amount of signaling traffic generated by the air interface. The signal load unbalanced 3G cells and bogged them down. "Some of that had to do with the 3G protocol, which has a lot of signaling [overhead] associated with establishing a connection," says Vish Nandlall, CTO and head of strategy in North America for Ericsson, a major supplier of cellular base stations. "LTE is a much more streamlined protocol. There was a lot of foresight in developing LTE in terms of how many messages are passed back and forth to set up a session." As more users come online with LTE devices, the issue will become network capacity rather than coverage, Nandlall says. LTE has a "huge capacity advantage" at the outset because it's typically using wider channels than 3G, 10MHz compared to 5MHz, he says. Carriers are creating a distinctive network architecture for their LTE deployments: first, large macrocells for uniform geographic coverage, and then under that umbrella, an array of variously-sized smaller cells to reuse spectrum and increase capacity in local areas. "The small cells will add finer grained capacity between the existing macrocells," says Phil Bull, OSS solutions manager for Amdocs, which sells software and services for carrier billing, CRM and operations support systems. "If you have a well-planned network, with enough capacity, it will be able to sustain the rates that you've committed to [as a mobile carrier] for a given set of users in a given area," says Eran Eshed, co-founder of Altair Semiconductor, an Israel-based LTE chipmaker. Users in some urban areas might find that changing, as popular LTE smartphones and tablets connect in ever greater numbers. Cellular, like Wi-Fi, is a shared medium: the capacity of a given radio is shared among the users connecting to it. "Where you have [LTE] coverage today, you have plenty of capacity," says Phil Marshall, chief research officer for Tolago Research, a research firm focusing on the mobile broadband market. "But in urban areas, you'll see performance go down [over time]. At the rate at which usage is growing, it's not long before you hit the capacity limit." LTE vendors and carriers agree that LTE users quickly double their data usage compared to 3G. Much of the increase is in video: with its much reduced latency. LTE consistently yields a more seamless and fluid video experience for users. "At this stage in the market, users will notice a significant performance enhancement," Marshall says. "You'll see a lift [in traffic] as people can do more and do it faster." Yet actual performance, even in the same location, varies widely. Consider these 2012 test results for Atlanta,summed up in charts from PC Magazine, PC World, and RootMetrics. All three agreed that AT&T's LTE network had the fastest average download speed, but each had a different speed: 18.3M, 17.2M and 11.6Mbps. AT&T Mobility's headquarters is in the Atlanta area. Verizon LTE was second, in two of the tests, with 10.8M and 8.79Mbps. T-Mobile - with its HSPA + 4G network - was second in one test, with 7.31Mbps and almost tied with Verizon for second in another - 8.36Mbps for T-Mobile vs. 8.79 for Verizon. Sprint was consistently fourth: with 3.24M, 3.65M and 5.1Mbps. So even if you do your homework on the best carrier for your needs, be aware that your experience may vary. One area that LTE subscribers can expect big changes in is data plans. Carriers are experimenting with new options, though today the choice is between the tiered plans from AT&T and Verizon and the currently "unlimited" plans from Sprint and T-Mobile. "The carriers are being mostly accurate in saying that 2 Gigabytes covers the preponderance of usage for most subscribers," says RootMetrics' Bill Moore. "But data caps affect your usage of that phone: your data plan changes the consumer's behavior." Some early adopters with a big appetite for mobile data are migrating to Sprint or even T-Mobile as a result, he says. Carriers, analysts and vendors agree that subscribers who move to LTE at least double their data usage. Verizon says that, as of June 2012, about 12% of its contract subscribers were using LTE. Regardless of the exact percentage, the LTE users now account for about one-third of Verizon's total data traffic, according to the carrier. "The reason data consumption goes up as it does, is video," says Roger Entner, principal with Recon Analytics, a telecom consultancy. "With LTE, we're now watching video on mobile devices like we watch it on television, with no buffering. About 60% of network data traffic is video, and that's rising." Shared plans let multiple devices dip into a common data bucket, says ABI's Philip Solis. "But there are per-device per-month fees, which can vary depending on what kind of device you have, plus the costs of a larger monthly data plan." That can quickly add a lot of money to the monthly bill for a user or family. That can, and should, make users cautious. "LTE is not a life-changing experience," Marshall says. "If someone is eager to get LTE today, they'd be focused on Verizon," he says. "If someone is interested in LTE but happy with the [cellular] experience they have right now, they can wait for their respective providers to deploy it in their area." All the carriers are moving in the same direction, he notes, and users will eventually see similar performance levels across the rivals. "If you're the usual user who waits for maturing technologies, there's not an incentive to change [to LTE], at least at this stage," Marshall says.